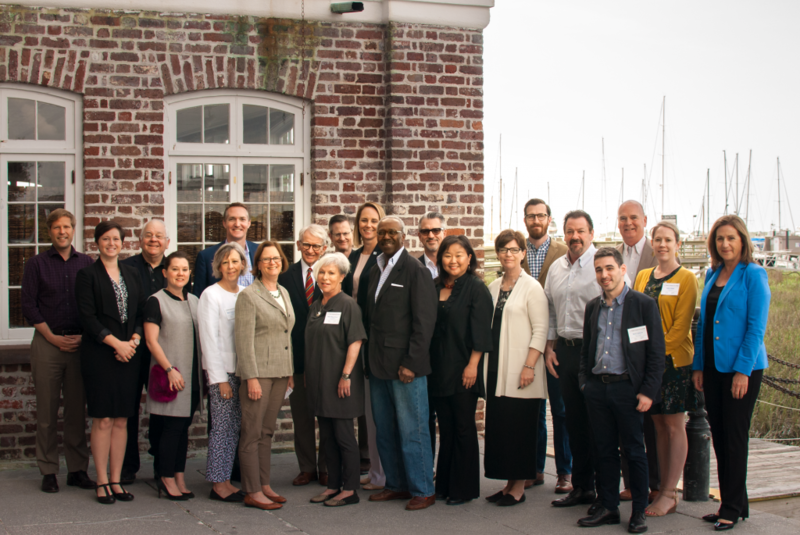 APRIL 2018 – Charleston, SC – The 69th National Session of the Mayors’ Institute on City Design (MICD) was held in Charleston, SC from April 11-13, 2018. Hosted by Charleston Mayor John Tecklenburg, the event was attended by Albuquerque, NM Mayor Tim Keller; Bozeman, MT Mayor Cyndy Andrus; Eugene, OR Mayor Lucy Vinis; Findlay, OH Mayor Lydia Mihalik; McKinney, TX Mayor George Fuller; Santa Clara, CA Mayor Lisa Gillmor; and St. Augustine, FL Mayor Nancy Shaver. Experts in architecture, landscape architecture, urban planning, real estate development, transportation, and urban design joined the mayors in the two-and-a-half-day discussions and offered pragmatic advice on how the mayors could approach the design and development challenges facing each of their cities. The 69th National Session began with a tour of Charleston led by Josh Martin, Senior Advisor to Mayor Tecklenburg. Later that evening, the opening reception and dinner took place at City Gallery, where Mayor Tecklenburg, who completed the Mayors’ Institute in 2016, welcomed participants to Charleston. MICD Executive Director Trinity Simons, National Endowment for the Arts Design Specialist Katherine Bray-Simons, and U.S. Conference of Mayors CEO & Executive Director Tom Cochran gave opening remarks to prepare participants for the session. Former Charleston Mayor Joseph P. Riley, Jr., who founded the Mayors’ Institute in 1986, then gave an enthralling keynote about the development of the city during his 40 years in office. Mayor Lucy Vinis initiated the discussions the following morning with a presentation on Eugene’s downtown riverfront area. As a large mixed-use development takes shape along the Willamette River, the city has a unique opportunity to repurpose a historic steam plant building as a new community hub. The Resource Team suggested ways to maximize public access to the river and make the new riverfront area a beloved community asset. Mayor Tim Keller followed, eager to hear the team’s thoughts on opportunities for quality open space in downtown Albuquerque. The Resource Team suggested a number of ways to use design to help tackle the city’s most pressing challenges. By repurposing existing open space and improving the physical connections between neighborhoods, the city can attract economic development downtown and help shape a thriving urban core. Mayor Nancy Shaver closed out the first day with a presentation on St. Augustine’s transportation challenges in its historic downtown. The narrow streets in the oldest area of the city – dating back as far as the sixteenth century – draw large crowds of visitors, creating challenges for moving people around safely and efficiently. The Resource Team suggested using street design, wayfinding, and pop-up events to capitalize on the walkable scale of the historic area. To kick off the second day, Mayor Lydia Mihalik presented an overview of a significant flood mitigation project in Findlay. Through of combination of lowering the floodplain and buying out flood-prone properties, the city will free up a significant number of riverfront parcels near downtown. The project sparked a lively discussion about potential uses within the new space, including trails and parks. Mayor Lisa Gillmor presented on the dense new “city within a city” soon to be built out in northern Santa Clara. With extreme pressure to build new housing, the city is fielding a number of proposals for dense mixed-use developments in this historically industrial and commercial area. The Resource Team recommended strategies for incorporating quality open space, affordable housing, and other public benefits into any new developments. Mayor George Fuller described development opportunities in the area immediately east of McKinney’s vibrant, historic downtown district. With a number of potential new developments and adaptive reuse projects, the city hopes to channel growth and investment eastward from downtown. The discussion centered around placemaking and improving pedestrian connections to lay the framework for this vibrant new district. Mayor Cyndy Andrus concluded the Institute with an overview of a new trail corridor project in Bozeman. The city owns much of the right-of-way along a railroad that connects two up-and-coming neighborhoods. The Resource Team dug deep into opportunities to create a multi-use path and quality open space in this area of the city. Joining the mayors at this National Session was a distinguished group of Resource Team members: Seattle Public Utilities General Manager/CEO Mami Hara; Jason Hellendrung, Vice President of Planning & Design at Tetra Tech; David Lee, President of Stull and Lee Incorporated; James Lima, President of James Lima Planning + Development; LMS Architects Principal Marsha Maytum; Peter Park, Director of Peter J. Park LLC; Addie Weber, Senior Planner at Toole Design Group; and Bill Weyland, Chief Strategy Officer of Weyland Ventures. The Mayors’ Institute on City Design is a leadership initiative of the National Endowment for the Arts in partnership the United States Conference of Mayors with support from the Trust for Public Land. Since 1986, MICD has helped transform communities through design by preparing mayors to be the chief urban designers of their cities. MICD conducts several sessions each year. For a list of upcoming events, past participants, or for more information, visit micd.org and follow @MICDdotORG on Twitter.